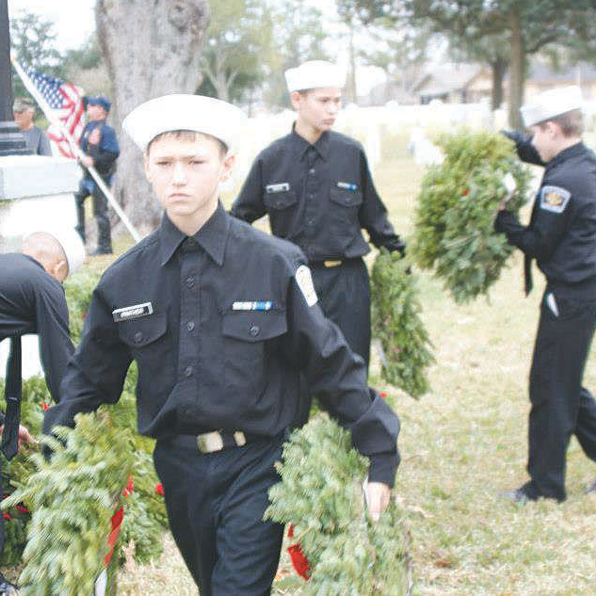 WREATHS ACROSS AMERICA — Members of the United States Navy League Cadets Baton Rouge division participated in Wreaths Across America at the Baton Rouge National Cemetery hosted by the Blue Star Mothers of Louisiana. The event included music from the Baton Rouge Pipes and Drums, a motorcycle brigade by the Patriot Guard Riders, and wreaths were presented to a member of each branch of service. Wreaths were presented to the families of fallen soliders and were laid on many of the graves in the cemetery. The cadets helped unload wreaths off the truck, assisted with holding flags during the ceremony, passed out wreaths to all in attendance, and placed wreaths on the graves. Two Cadets are Tanner and Tommy Prather, both Central residents and sons of Ashley and Brody Prather. December 21 and 22 • ZooLights • 5:30 to 8 p.m.
BREC’s Baton Rouge Zoo invites you to visit ZooLights. In addition to our lighted displays of peacocks, tigers, and 30-foot elephants, visitors can try their luck with Reindeer Games. ZooLights admission is $5 for adults and teens, $4 for seniors, $3 for children 2 to 12, and free for 1 and under. For information, visit www.brzoo.org. Come and have tea with Mrs. Claus while helping to fight cancer. Enjoy live Christmas music, finger foods, punch, desserts, crafts, games, and have your photo taken with Mrs. Claus and her elves. While the children enjoy a fun filled afternoon, parents can visit with friends and participate in a gift raffle. All proceeds will go towards the treatment of Clayton Castle, a seven year old boy fighting cancer. Son of Chad and Kesligh Castle. St. Alphonsus Catholic Church, 14040 Greenwell Springs, will hold Christmas Mass at 4, 5:30, 6, and 8 p.m. The Bell Choir program will be at the 5:30 p.m. Mass. Comite Baptist Church, 12250 Greenwell Springs, will have a Candlelight Christmas Eve Service. Monday, December 24 • Christmas Eve Service • 11:30 p.m.
Sandy Creek Baptist Church, 22834 Liberty Road, will have a Candlelight Christmas Eve Service. Thursday, December 27 • Make and Take Pennant • 2 to 4 p.m. Welcome the new year with this colorful pennant. Stop by the Children’s Room at Jones Creek Library, 6222 Jones Creek, anytime to make your craft. For ages thru 11 years. St. Alphonsus Catholic Church, 14040 Greenwell Springs, will hold Solemnity of Mary, a Holy Day of Obligation, at 8 and 10 a.m. and 12 noon. For information, call the church office at 261-4650. Saturday, January 8 • Zachary Teen Council • 6:30 p.m.
Join to fulfill great New Year’s resolutions: meet new people, make new friends, and help your community! This active group of teens meets monthly and provides input and assistance to the Zachary Library, 1900 Church Street. Participate in creative open mike nights, competitive quiz bowls, and other super-fun activities. For inforamtion, call 658-1870. Wednesday, January 9 • The Book Buzz • 4 p.m. Teens come and hang out at Baker Branch Library, 3501 Groom Road, and discuss the books you’re currently reading! We’ll discuss stories you may enjoy reading next. Light refreshments will be served. For information or to register, call 778-5960. Thursday, January 10 • Medical Explorer Post Program • 7 p.m.
Are you a mature student, age 15 to 18, interested in a career in health care? The Medical Explorer Post Program might be for you. The first meeting will be held at the City Parish Emergency Communication/Operations Center, 3773 Harding Blvd. As a Medical Explorer you will receive valuable experience needed for many health care programs. For information, contact EMS at 389-5155 or email atoups@brgov.com. Wednesday, January 23 • Make a Desk Organizer • 4 p.m. Teens come to the Baker Branch Library, 3501 Groom Road, and create a desk organizer. All supplies will be provided and light refreshments will be served. For information or to register, call 778-5960.